Apple showed off the new MacBook Pro’s Touch Bar functionality on stage using third-party apps from big names like Microsoft and Adobe, when it debuted the notebook a few weeks back at a special media event. With Microsoft and Adobe offering Touch Bar functionality for their flagship softwares Office and Photoshop respectively, Apple has now released a list of around 20 apps that will utilize the functionality (via TechCrunch). 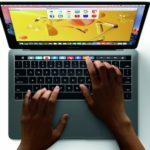 The list shows the apps that will offer Touch Bar functionality between now and the end of the year, with more to follow subject to a similar vetting process as the one Apple has in place for its App Stores.